“Eliana” Round brilliant halo cluster design. “Jacintha” Asscher cut diamond halo ring. “Joanna” twisted band diamond set solitaire ring. “Vesta” Pear shaped diamond in a split band setting. “Manuella” Asscher cut diamond halo ring. “Manola” Ceylon Sapphire diamond ring, antique style. 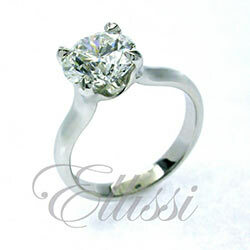 “Sylvia” Three-stone oval cut diamond ring. “Penelope” Round brilliant cut in a wrap around band.